Club Penguin Cheats by Mimo777 Club Penguin Cheats by Mimo777: Another Club Penguin Reviewed by You! Club Penguin has posted their weekly Reviewed by You. "The best thing Rockhopper has ever brought was the very first potted plant. We didn't know what to think of it at first, then the plant started sprouting! Everyone was so amazed! I can't wait to see what Rockhopper brings this time! Rock on, Club Penguin." This week, Club Penguin would like to know: "What are you, your friends, and your puffles planning for the Fair?" The under ground pool leaking hasn't stopped. It was just an excuse for a party! or maybe swedish fish and danish chocolates. mimo today i had school and it was so boring! we even got homework! they should have like sherbert sweets n sooooo much candy! wen r the caption contest results??? Cool Mimo thanks for the update dude. I think the winner of that caption contest should get whatever you have in stock (ex. membership, coin code) or even better, they get to submit an idea for a caption contest and you use it! Hey mimo when r the next mod promotions me and happywagon were wondering? Ooh... starbursts.... that's like my fave candy! My friend at a school meeting thing today secretly gave us a bunch of starbursts lolz! OMIGOSH DANISH CHOCOLATES. MULTIFLAVORED SWEDISH FISH. OMIGOSH. DON"T EVEN MENTION THAT. I"LL BE TORTURED AAAAAAH! STARBURSTS! CHOCOLATE!! MULTIFLAVORED SWEDISH FISH AAAAAAH I"M DROOLING DON"T DO THIS TO MEH!! Lolz! ;-) ;-) ;-) wink wink, nudge nudge! mimo i bet they will have fried twinkies! :D i love thosee i had one, it was yummy! RED VINES ARE BETTER BUT TWIZZLERS ARE GOOD OMIGOSH THIS IS TORTURE!! yo mimo its me soury6 matthew722 friend he said his computer broke down so he wont be able to mode for a few days or less anyway thx bye. Hey mimo. sweet review!!! anyway i noticed a lot of water coming from nowhere at the night club near the green puffle. my penguin name is manvswild9. YOU ROCK MIMO! mimo! i went on my account and the paycheck said it was from novmber 17 2013! wierd! Also there is a fall fair loading screen too. CP should make a park. I mean, how long has it been since they added another main outdoor place? a park would be awesome! They could have a furniture catalogue for the park, too, so you can make ur own park in your iggy. They should have a slide, ropeswing, ladder leading up to a fort, swings, and even if they don't move it'd be a great hang-out place! P.S. send in a request and tell your friends too as well, and then we just may get a new room!! What do you wish club penguin could have? oh and if its not already in cp and u like the idea,, SUBMIT IT AGAIN!! Yes we will! But we'll have to buy items with tickets though! Hopefully sometime this week. It may take a little while for him to pick. I was wondering the samething! We will get promotions probably sometime in the beginning of this month! I suggest next year probably. Our newest room added was the Dojo Courtyard which about 10 months now! We've had the same outdoor rooms for about 3-4 years! Yes there are items to buy at the fall fair, but not with coins, you need tickets which you can only make at the fall fair! hope this helped! hey mimo that looks like a cardboard coutout of rochhopper! if u look closely u can and will see wat im talkin bout. Thanks so much about the peace signs! lol. I also have these: ★ & ♥. So what do you think? lol. Oh and also thanks for the info. Thanks! Everytime you go on the pirate ship from the beach it saw" please quit your game be for enteing another room"
zo and zur how do u make the peace signs!? 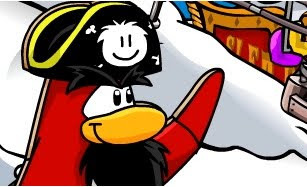 Wer iz Rockhopper???? I mean,like, wat server? Cuz I really wanna find him.